Kybella targets excess fatty tissue that accumulates underneath the chin to cause the appearance of a double chin. Kybella injections work by destroying unwanted fat cells at the root of your double chin. And once those fat cells are gone, they can never return! * Kybella is a prescription-strength formulation of deoxycholic acid, a substance that is found naturally in your body in order to help remove dietary fat. When carefully and precisely injected directly into the fat cells underneath the chin, Kybella destroys the cell membranes. The fat cells burst and are painlessly and comfortably reabsorbed into the body. As the fatty tissue is absorbed, your chin regains its sleek, youthful appearance. *Individual results may vary. Results are not guaranteed. Fat cells destroyed by Kybella cannot return. However, remaining fat cells under the chin can continue to grow and expand, so to ensure long-term results, it is critical to maintain a healthy diet and exercise and avoid weight gain. If you are interested in learning more about Kybella and how it can address your unsightly double chin, please contact double Board certified cosmetic surgery specialist Dr. Landon D. McLain and our team of specialists at McLain Surgical Arts, conveniently located in Huntsville, AL. 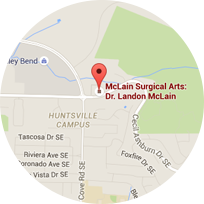 We look forward to speaking with you, and to scheduling your initial consultation today!